If you're the cameraphone freak type move right along - this one isn't worth your time. What you get on the Samsung Galaxy Y is a 2 MP fixed-focus camera that can capture photos in 1600 x 1200 resolution. Not what you'd call exiting. Contrary to the camera's capabilities Samsung has equipped the camera app with the great user interface, which is touch-friendly and has great built-in features such as smile shot, preset scenes on-screen guidelines and panorama mode. Back to the bad stuff - the camera of the Galaxy Y will do only if you're desperately in need of a MMS-quality picture of something and drawing just won't cut it. There's a very low amount of detail, exposure is very bad and often you'll get too dark or way too bright pictures with undistinguishable objects in them and colors are way too dull. Check out the samples below to get an idea of the quality. Still you can't really go all that hard on the Galaxy Y - it's just not meant for a cameraphone. It's in the lowest class of Android and in order to retain a lower price it has to do with setbacks. The occasional MMS is covered with the 2 MP snapper and on such a small screen with such a low resolution the quality doesn't matter all that much. Naturally, the Samsung Galaxy Y offers video recording too, and as it’s only QVGA at 15fps, we wouldn’t use it for anything other than MMS. The video recorder’s UI looks similar to the camera’s interface. And here goes an untouched QVGA@15fps sample for direct download. The Galaxy Y is ready for worldwide roaming with quad-band GSM/GPRS/EDGE and dual-band HSPA with download rates of up to 7.2 Mbps. The connectivity package offers Wi-Fi (b/g/n), Bluetooth 3.0 with A2DP support and USB v2.0. The USB interface is standard microUSB, which makes finding a suitable cable a lot easier. The Samsung Galaxy Y doesn’t pack much internal memory (180MB is downright low for app installation), but it comes with a microSD slot with supports for cards up to 32GB. The 3.5 mm standard audio port completes the connectivity tally. You can keep your favorite headphones and use them with the Galaxy Y hassle-free. The Android browser is great for mobile browsing, especially on the latest version of Gingerbread. But on the 3-incher of the low-quality QVGA resolution you'll need a lot of patience to go through a page or read an article. The user interface is pretty much nonexistent at first sight. Once the page loads, all you see is the URL bar and the bookmark button on a line at the top of the screen. Once you zoom in and pan around though even that line disappears (scroll to the top or press menu to bring it back). 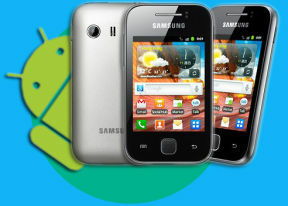 The Galaxy Y browser supports three zoom methods – dedicated buttons, double tap and multi-touch pinch-zooming. The browser also supports text reflow – a moment after setting the zoom level, columns of text align to the screen width. There's bookmark list that shows a thumbnail of the bookmarked page and you also get a “most visited” list in addition to the history. The Samsung Galaxy Y has the YouTube app to partially compensate for the lack of Flash support. Of course, there are plenty of other video sharing sites and sites that use Flash for completely different purposes, but you have to live without them.